•	Reminds your day of appointment. • Automatically creates and adds appointment to your calendar. • Automatically backs up user's calendar and restores on re-installation or factory reset. • User can safely transfer all the appointments to any Android mobile by just configuring the email ID on new device. •	Reminds through title bar notification and SMS. •	Option to enter Doctor’s or Hospital name. •	Option to enter Doctor’s/Hospital details. •	Option to enter appointment details. •	Option to select date of appointment. •	Option to configure flexible time of appointment. 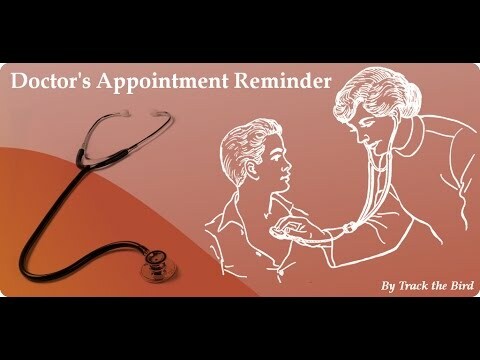 •	Option to configure appointment reminder time with notification. •	Option to configure “A day before” SMS reminder and notification. •	Options to store Doctor’s contacts details like phone/mobile number and Email address. •	Option to call doctor directly from the application. •	Option to send SMS message to doctor directly from the application. •	Option to send an Email to doctor directly from the application..
•	Update existing appointment details. •	User can store Un-limited number of appointments. • Soon many more features are going to come...Please wait.. When you put your android phone on "mute" or "vibrate" mode, the phone ONLY mutes the ringer and notification sounds. It does NOT mute applications, such as games or media players. This means that if you have the Doctor's Appointment Reminder alarm enabled under settings, the alarm will sound even if the phone is in vibrate mode. This application is integrated with Google Analytics to provide better result to customer. Also, users appointment details are backed up in the server and it will not be shared with anyone else other than the owner. Free version has only limited features. Also, user can create only a limited number of appointments.